This past summer was full of civil actions and resistance in Puerto Rico, with many people reclaiming and asserting their rights to protest and to defend their humanity. The struggle is real in the archipelago and is part of a longer trajectory of civil unrest, but the summer of 2016 seemed to pile on one too many issues that Puerto Ricans could not remain silent about. The environment was at great risk from many sources this summer. Firstly, the municipality of Peñuelas was proposed as the dump site for tons of toxic coal ash waste. According to the Sierra Club, “the public health hazards and environmental threats to nearby communities from unsafe coal ash dumping have been known for many years, including increased risk of cancer, learning disabilities, neurological disorders, birth defects, reproductive failure, asthma, and other illnesses.” Despite these known health hazards, the global power company AES sought to dump the ashes without any safety protocols. Many peñolanos protested, even chaining themselves to equipment and trucks, putting their bodies on the line and getting arrested by national police. They had great success that was challenged at every step of the way. A judge prohibited the use of the Peñuelas landfill for coal ash waste disposal early in the fall. AES was still attempting to send truckloads of ash to be spilt on the landfill, going against direct orders. Protesters put further pressure upon the government and the legislature made sure the court’s decision was enforced. Secondly, the governor’s office proposed aerial fumigation with the chemical Naled in order to rid the archipelago of Zika-carrying mosquitoes. Naled is an organophosphate insecticide with similar effects to the nerve agents sarin gas and VX, and can be highly toxic to bees, wildlife, and humans, especially when sprayed irresponsibly. Many women—particularly mothers who could be affected by the chemicals alongside their children—marched, protested, organized petitions, and pushed back, with the help of scientists and medical experts, enough to successfully convince Governor Alejandro García Padilla to withdraw the fumigation proposal. It remains unclear, however, whether the protest was actually effective. Dangerous fumigation substances have been utilized in Puerto Rico before. Not only could they be used again, but they also may have already had dangerous consequences for our health. 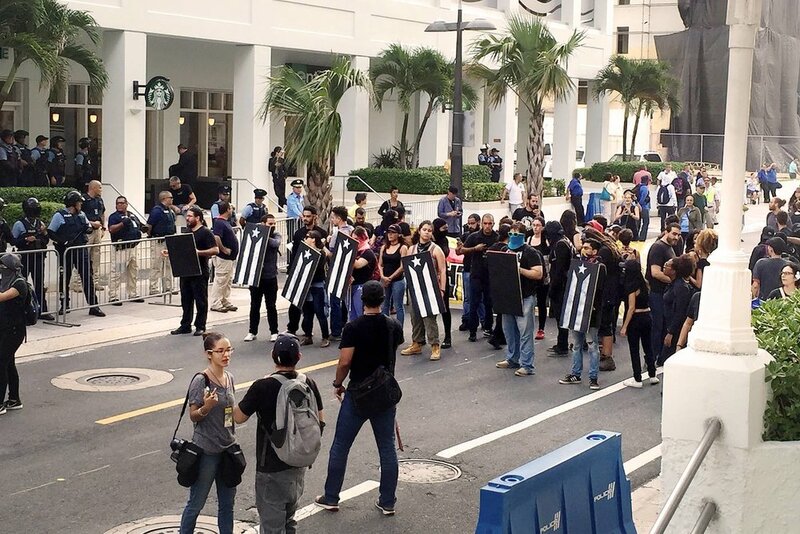 These proposed attacks upon the environment happened at the same time that many Puerto Ricans were still mourning the victims of the Pulse nightclub massacre in Orlando, especially the 23 compatriots who lost their lives that terrible June night. Many Puerto Ricans were in shock that this could happen; that they became part of LGBTQ+ history through tragedy, that such terrorism was now something that so many of our people have to contend with. As if all that were not enough, Puerto Rico’s government welcomed a Fiscal Control Board, an austerity measure approved by President Barack Obama, to take control of the archipelago’s financial decisions and budgets in the wake of the Puerto Rican government’s staggering 73 billion dollar debt. This Fiscal Control Board plans to further cut the budgets of certain services and institutions imperative to the livelihood of Puerto Ricans. This will mean, for example, more school closings and hospital staff cuts. Many Puerto Ricans participated in direct actions such as resistance campouts and protests, but members of the artistic community in Puerto Rico’s urban centers used their work to voice the discontent of the people through the visual and visceral medium of muralism. They articulated, and keep articulating even to this moment, what we were all feeling and thinking about being Othered colonial subjects whose fates are repeatedly tied to outsiders with more so-called authority on both sides of the Atlantic. The piece that became most poignant, and useful to the Puerto Rican people transnationally, was one created by the art collective Artistas Solidarixs y en Resistencia (Artists in Solidarity and Resistance). This group, composed of young Afro-Puerto Rican and queer women who are art students, but whose identities remain anonymous, was critical to the nation’s articulation of discontent. Four years and a half ago, the collective had painted the Puerto Rican flag upon the door of one of the several abandoned colonial-style properties located in the tourist trap of Old San Juan as a means to promote national pride and identity. The door on San José Street became a beacon of pride for Puerto Ricans, and a nice colorful backdrop for tourists. This sentiment began a very important dialogue among Puerto Ricans. Some reacted quite negatively to this blackening of the flag. Puerto Rico’s culturally-based nationalism uses the flag as its symbolic base, so it was bound to offend some. However, the great majority of people were able to see this “new” flag as an embodied and decolonial articulation of grief, anger, and desire for political change. Other artists have responded and taken up black as their color to show their support. Several other pieces of urban art, including additional murals, appeared in the metropolitan areas of Puerto Rico within a week of the collective’s re-mastering of the flag. Now that it has been seven months since the unveiling of the new flag, many Puerto Rican cities have become spaces of artistic protest, but so have Diasporic places like Florida and New York. Murals are not the only result, however. Everything from performance art to adopting the new flag as a physical shield against the state (as seen in the picture above) has become part of the artistic sociopolitical resistance of Puerto Ricans. Many questions remain, chief among those: Will the artistic response last, especially with the election of a staunchly Republican governor and hateful President? Will it catapult the anti-colonial moment that Puerto Rico is confronting into a revolutionary moment? We can only wait and see. Bethzabeth (Beth) Colón Pizzini, born and raised in Puerto Rico, is a second year PhD student in the Department of African and African Diaspora Studies. She holds a Bachelor of Arts in Political Science and Latina/o Studies with a History minor from Northwestern University. Her research interests include race, class, gender, sexuality, and space in Puerto Rico; Afro-Puerto Rican youth music and aesthetics; Afro-Puerto Rican women’s subjectivity and activism through art; and Afro-Puerto Rican cultural and community politics.